Ever since Destiny 2 launched, the community has been very vocal about the state of the game. Its first expansion, Curse of Osiris, was not well received, and several recent updates have come across as nothing more than half measures. Much of the player base has dropped off and moved on to other games and this latest expansion may not quite have what it takes to lure everyone back, at least presently. Destiny 2 suffered from a massive lack of content when it dropped last September. It also didn't help that the entirety of Destiny 1 was removed instead of allowing Destiny 2 to build from it. When the game released, players had worked through much of the content in no time at all and wanted more. Curse of Osiris offered up a new playable space that was far too small to be anything worthwhile and the expansion just didn't reinvigorate the player base in the way I think Bungie wanted. Destiny's newest expansion, Warmind, looks to fix many issues that players have had with the game since launch as well as several 'quality of life' updates that have been requested as far back as the original Destiny. Thankfully, the updates as of 1.2.0 are available for free which allows players to select up to four Emotes at a time, take part in the new Crucible ranking system, host private matches, and enjoy the increased vault space. For those who choose not to purchase this new DLC, you will be at least able to play the new Crucible maps, but through the traditional playlist only. I would assume that if you are still playing Destiny 2 that buying the new DLC is probably a no-brainer considering all the new content you've probably been dying to experience. Both Curse of Osiris and Warmind looked to dig deeper into the lore that Bungie has created for the world of its MMO shooter. Warmind does a slightly better job in crafting a decent story than CoO, but the abrupt ending to its short two-hour campaign had me, and from what I've read, several others, scratching their head wondering if there was more. 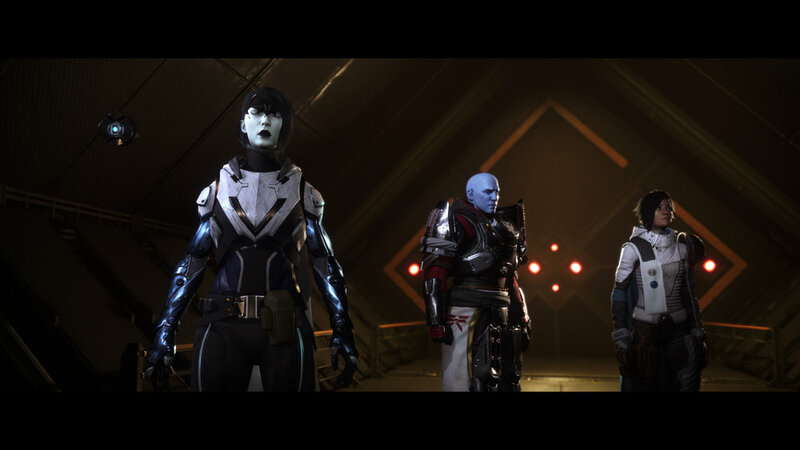 The story follows Ana Bray, a Hunter Gunslinger, and a member of the House of Bray as she attempts to track down Rasputin, a Warmind built to defend Earth during the Collapse. While the campaign has several cool moments and two stellar boss encounters, the whole of the story can be easily completed in just over two hours, even less so if you play with a full fire team. The most disappointing aspect of the story here is that it is full of so much potential given the characters featured here and how intricate the lore of Destiny has been across both games. When the story ended, I was puzzled at how so little happened and how such a big twist in the story just remained there, unanswered. 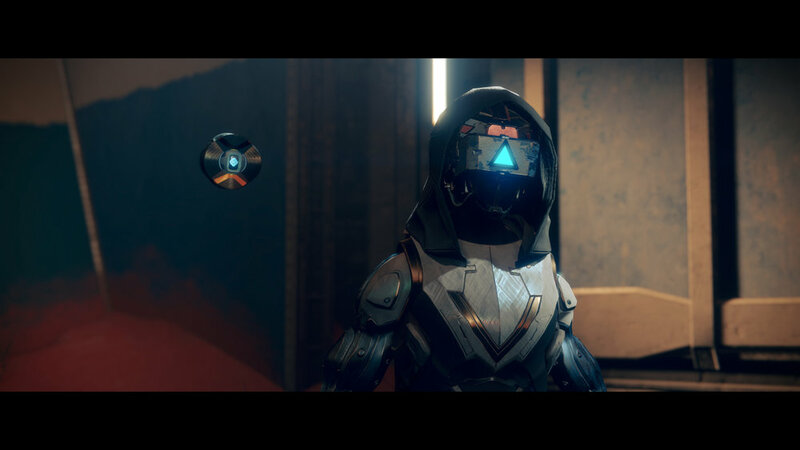 I was also surprised that Cayde-6 wasn't included given his very well known ties to Rasputin himself. Players have wanted to see the return of the original Destiny's core planets for some time now, and while we return to Mars for this new expansion, it is through a brand new section of the planet we haven't seen before. 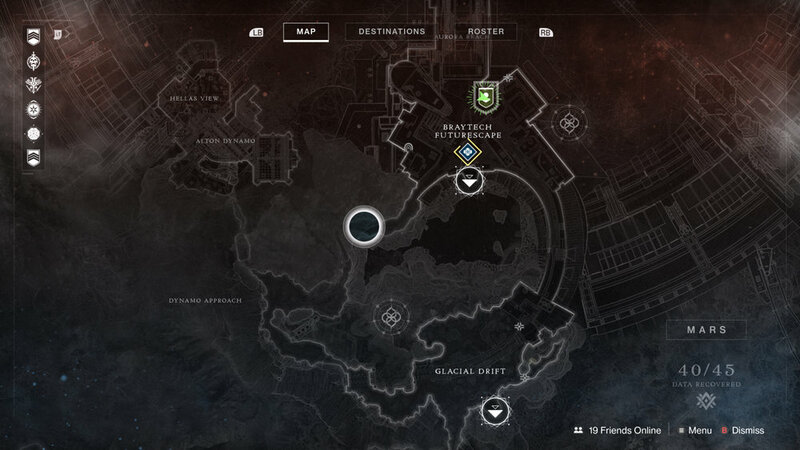 This location is roughly the size of Io; which is one of the new planets that was added to Destiny 2. While it's not the biggest location for the franchise yet, it is a considerable improvement over the playable space offered in the previous DLC. This new section of Mars still maintains its fashionable reddish sand, but also ice caverns and snow-capped mountains. These new elements to Mars really add something to the game and are easily my favorite parts of this new content. The new location offers up a decent amount of secrets to discover like shooting a series of 45 colored discs to unlock a new weapon and another special item I won't spoil here. You are also treated to a few Lost Sectors to keep you busy for at least a little while as well as a few adventures, patrols, public events, and quests to take on, with one that unlocks the return of a popular exotic linear fusion rifle. Apart from the story campaign, and the various other activities available to you, I would say that the three new strikes would also offer something new as well, but that just isn't the case, for the most part. While the PS4 exclusive strike is an entirely new mission, the remaining two strikes here are nothing more than two story missions from the Warmind campaign repurposed with an added boost to their difficulty. The fact that Bungie didn't even craft two new strikes is a frustrating disappointment for sure, but one that frankly, I am just not surprised by. While you'll tackle these missions at a much harder difficulty, the rewards for completing them are lacking at best. When Destiny 2's main campaign ended, we were treated to a tease of new threats we hadn't seen before. When Curse of Osiris was first shown off, many players were upset that we didn't really see much in the way of a new enemy faction. There were variations and small additions made to the existing races we've seen before, but it was, for the most part, business as usual for what we would be taking down during our adventures. Warmind had several supposed leaks during its development with one of them being the addition of a new enemy faction. This leak, however; turned out to be false, and apart from the Hive dressing up in outfits made of ice and a shield added to one of the more imposing members of the Hive, there is really nothing new here to take down that we haven't already killed a million times before. The most talked about new addition to Warmind is the inclusion of a new public event called The Escalation Protocol. This wave-based activity is easily the hardest content introduced to the series with players barely even scratching the surface of it as of yet. There is a total of seven waves to defeat, but the best I've seen so far and been part of is a group of us nearly completing wave 2. This challenge is brutal, requiring most players to be at least Power level 370. While you can tackle it starting at 320, it is pretty much pointless to even attempt it until you hit the soft cap of Power level 340. A total of nine players can take on this event and even then it can be a nail-biting bout of anxiety to even be a part of. Bungie has said that there are five different final bosses to the event with rotations happening each week. The rewards that drop from this event are exclusive to the boss that you take down at the end of the seventh and final wave. While there have been some adjustments to make certain Exotic weapons more powerful and feel more rewarding, the real meat of each new content drop is the addition of brand new weapons and armor. Five new Exotic weapons make their way into the game, with two of them being revamped from the original Destiny. 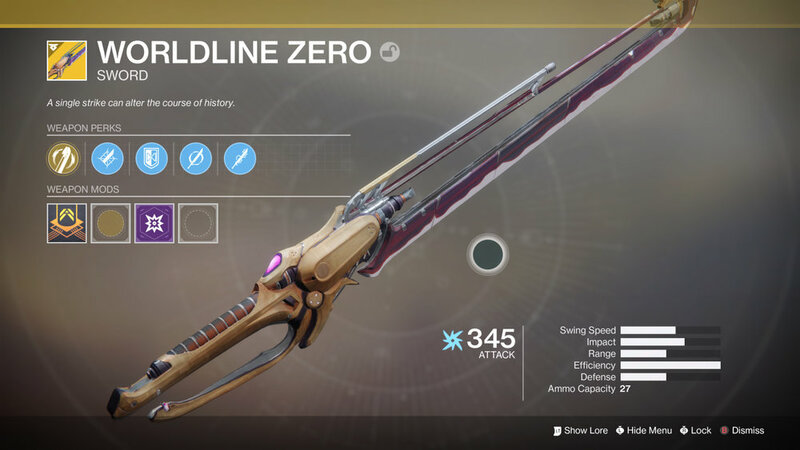 Wordline Zero, the new Exotic sword is probably my favorite new addition as it can dish out some serious damage and it also looks incredibly cool as well. There is also a pretty decent variety of new weapons and armor added to the game that can be viewed here, showing the sets earned through Escalation Protocol, Trials of Nine, the new Raid Lair, and more. For those playing on PS4, you can look forward to an exclusive armor set tied directly to the exclusive strike available only to players on that platform, for the time being anyway. Before melee weapons were added to the original Destiny, players got a taste of them through mission specific weapons like The Sword of Crota, forever changing the game. While the Valkyrie Spear doesn't quite have that type of impact here, the Rasputin-based weapon is still a powerful tool to use. You can fire out blasts or swing it down to the ground causing an intense blast. The weapon, apart from being a focus of certain parts of the campaign, can also be used during Escalation Protocol to assist not only in combat, but to unlock a few secrets as well. As you complete the campaign and take in a few of the endgame quests, you will earn the IKELOS_HC_V1.0.1 hand cannon. This weapon comes packaged with an additional quest that will keep going further until you eventually unlock an additional weapon that sees its long-awaited return. While I've never been a huge fan of hand cannons thus far, I'm actually quite impressed with this new gun and have been attempting to work my way through its lengthy quest. Exotic weapon quests have been some of the more impressive content in the series so it is nice to see Bungie continuing this type of content. The sheer amount of secrets this time around shows promise, but it is too soon to say if this will be enough to bring players back. Warmind sees the addition of two new maps added to the Crucible playlist; Solitude, and Meltdown. While players who haven't bought the expansion are freely allowed to take part in these maps via the random playlist, they cannot play these maps via their own private matches. The new maps are quite enjoyable, with Solitude taking part in a Warmind facility, and Meltdown centered around a visually similar Clovis Bray Special Projects structure. 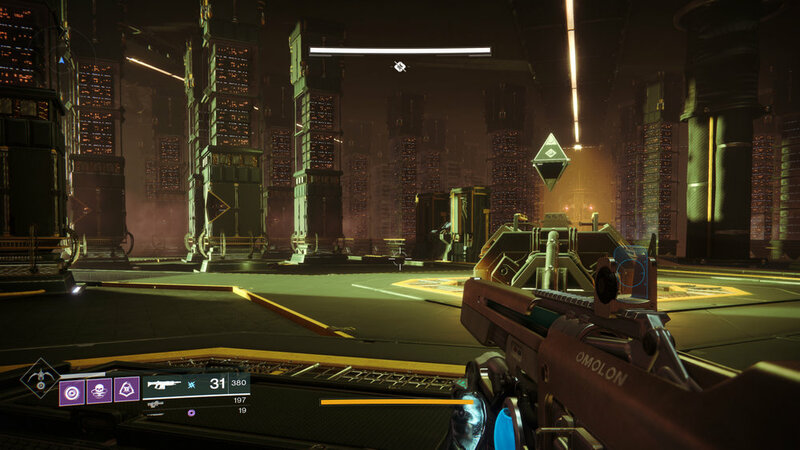 I'm holding out hope that Bungie makes a Crucible map based around the server rooms as shown in the picture below as it is one of the most impressive locations I've seen in the series to date. Crucible adds more than just two new maps during this update as a full-on ranking system has been implemented to give players something new to chase alongside the desire for more loot. The Ranking system has everyone start at the Guardian level and work their way through Brave, Heroic, Fabled, Mythic, and finally the top spot, Legend. Each new rank will see players receive a reward package that can contain special engrams, tokens, and even Masterwork cores. When you reach Legend status, players have the option to reset their rank, ala prestige, for a chance to earn even greater rewards. When a player hits the Fabled rank, they will unlock a special weapon exclusive to that season. This season's much sought after gun is the Redrix's Claymore pulse rifle that is currently a force to be reckoned with. Players that play through the Quickplay mode can earn Valor, whereas Glory will be earned through the competitive playlist, each with their own modes. Valor is earned win or lose, while Glory is only earned on a win, and a loss will result in a penalty. Bungie hinted that the new Raid Lair was going to be difficult, and that is quite frankly an understatement. The previous Raid DLC was beaten very quickly, but Warmind had most teams approaching almost double digits before the first team defeated it. I watched the majority of Youtuber Datto and his team attempt to tackle the raid before it reached well past 10 hours and then I fell asleep during the stream missing his much-earned victory. One of the main reasons that this newest Raid was so difficult is that it launched a mere three days after the new content dropped, meaning that hardly anyone had the time to be Power-level appropriate for it. The Raid recommends that your Guardian be at least 370 Power and given that the grind from 345 and up is incredibly slow, many players had no choice to start the Raid at a much lower level than what is recommended. The final encounter bumps up to 380 Power and several teams ended up calling it quits during this encounter due to how brutal it became to even just enter the damage phase let alone survive. While there are certain aspects to Destiny 2's Raids that are enjoyable, the fact that we return yet again to the Leviathan means that aesthetically, there isn't much new here. We are still taking down the Cabal, and frankly, if you were to glance at this Raid for a few seconds, you'll be hard-pressed to tell the difference between this one and the one that launched shortly after Destiny 2's release. What was impressive about the Raids in the first Destiny was their variety in not only the locations you explored, but the enemies as well. While it still lacks the impressive charm of the Raids from the first Destiny, it is certainly a team reliant challenge that will either have your team firing on all cylinders, or a lot of yelling and screaming when your teammates are dying all around you for the 400th time. While I've logged in some 15 or so hours with this new content, I'm almost ready to give up on the game yet again. I love Destiny, I do, but the lack of engaging content has left me wanting. While Escalation Protocol is a fun activity, the Power requirement to seriously take it on is staggering, not to mention getting enough players to commit to it. Apart from jumping back and forth between your trio of characters to repeating your milestones to earn powerful gear, there isn't a solid way to really grind to 385 in a fun and satisfying way. Most of the events drop items at the soft level cap of 340 and I'm finding it rather difficult to stay excited about earning a new gun or a flashy new armor piece. 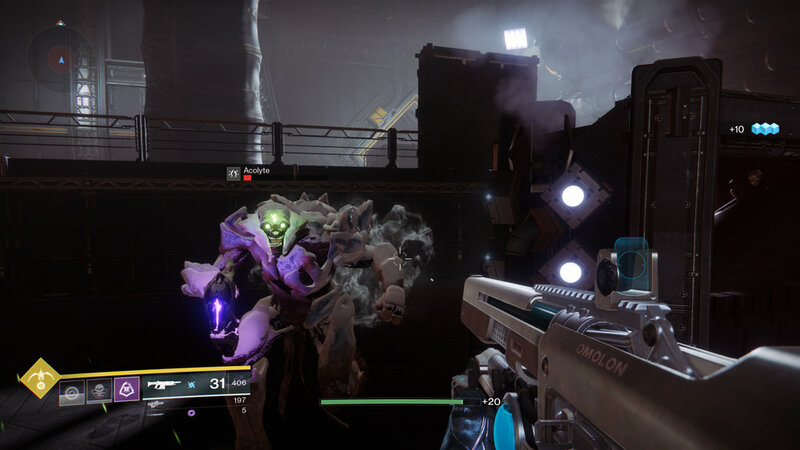 I would love to tackle the Raid, but right now my Power level is so low that a mere shady glance from a Cabal enemy would one-shot my Guardian. I don't mind the challenge, but right now It's a massive grind to get from 348 up to even 360, or 365, let alone 370 to even have a chance in either the Raid or Escalation Protocol. Bungie is making some nice additions to the game, but several of them are still far away and for a game that is losing players on a consistent basis, it won't be long before more of its community ends up abandoning it altogether. I want to see Destiny succeed and thrive and bring new ideas and gameplay systems to the game and get it closer to the later years of Destiny 1 when there was always something to do. 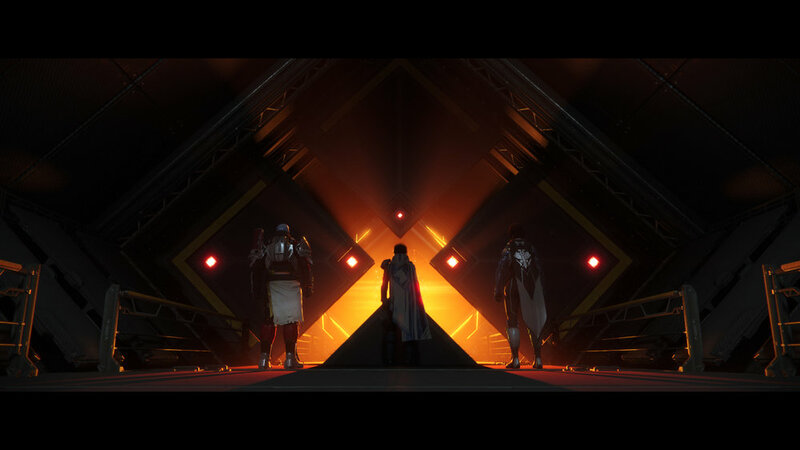 Destiny is still one of the most satisfying shooters from a gameplay perspective and unless this next expansion in September radically changes the game in the same way as the Taken King did way back when, then Destiny 2 will have the battle of its life this fall to just simply remain relevant, to say nothing of what Anthem and The Division 2 may do to it next year. Please note that as of the writing of this review, I have NOT attempted the Raid. Should that content change the way I feel about the game, then I will update the review accordingly. I have, however; watched a completion of the Raid from start to finish, so I am aware of the content available in the event. DESTINY 2: warmind DLC WAS PURCHASED BY THE REVIEWER.